Beat-Herder, the weirdest, wildest and most wonderful party in the UK festival calendar, returns for 2018. Running from July 13th - 15th, Beat-Herder will once again transform Lancashire’s Ribble Valley into a technicolour party and escapist’s utopia, with an array of 20+ whimsical stages, world-class DJs and surprises aplenty. First line up names include: Orbital, Soulwax, Django Django, High Contrast live, Congo Natty & The Rezistance live, Patrick Topping, Denis Sulta, Artwork, and loads more. 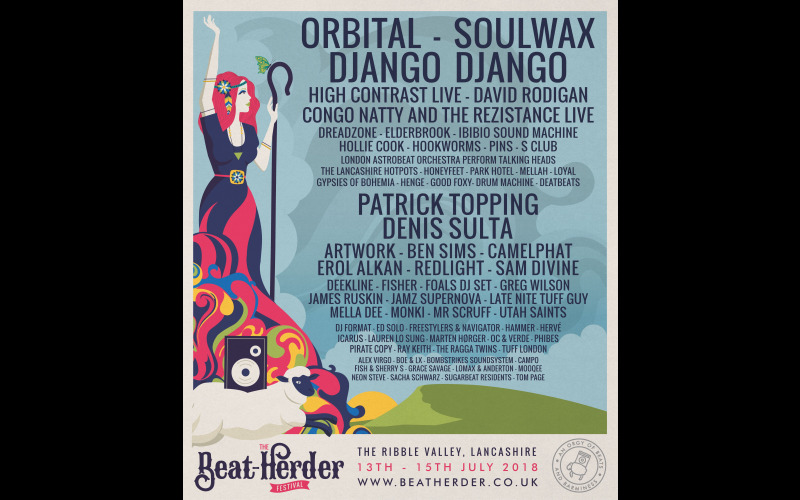 Originating from free party roots, over its twelve-year history, Beat-Herder has become known for uniting the disparate subcultures of dance music, and this year’s line-up proves no exception. Headlining the main stage this year are dance legends Orbital, whose dazzling lightshow and leftfield anthems such as ‘Chime’ are perfect summer crowd-pleasers. They’ll be joined by the likes of dance-rock crossover pioneers Soulwax; the consistently unpredictable sonic adventurers Django Django; and national treasure and firm festival favourite David Rodigan. One of the original pioneers of jungle, Rebel MC aka Congo Natty will play with The Rezistance live alongside Hollie Cook, former member of all-female punk/reggae band The Slits, and electronic afro-funk stalwarts, Ibibio Sound Machine. Music is just part of the experience at Beat-Herder. Entirely handmade from scratch, the stages stand out as something truly different in the increasingly identikit festival landscape. That attention to detail creates an immersive world full of beguiling and intriguing creative concepts. Which other festivals give you the opportunity to explore underground tunnels, dance to drum and bass in a chapel or get inked in the functioning tattoo parlour? And if the hedonism gets a little too much, guests can slow the pace by lounging in the heated hidden swimming pool or enjoy some retro entertainment at the site’s very own working men’s club. Beat-Herder continues to exist as it did back when it started as a free DIY party in 1998: uncompromising, unwavering and distinguished by an overwhelming sense of community. Its reputation as one of the friendliest festivals around can be attributed to its loyal followers - friends, couples and families who create new memories to cherish in a bold and barmy atmosphere each summer.